Grayson Thermal Systems are a registered agent of Forman (Firetrace) Fire Suppression Systems. Our highly skilled engineers are qualified to fit brand new Forman fire suppression systems as well as service and maintain Forman systems already fitted. We also carry stock to supply any components required from our parts warehouse quickly. 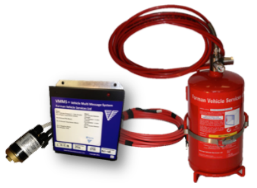 We are the UKs leading supplier of Automatic engine bay Fire Suppression for buses, with over 12 thousand kits in the field – in conjunction with our innovative ´V´ series products – we believe we offer the complete bespoke package for your safety and security needs. Forman Vehicle Services was established in 1989 and has been responsible for providing outstanding service/ products ever since. Our specialty is in the supply and installation of auto-electrical products and fire suppression. Our regular customers range from bus manufacturers and national operators to small privately owned fleets. Fire Suppression – No 1 UK Bus Supplier with over 12,000 systems fitted. Vehicle voice message system – Over 14,000 systems fitted on vehicles with bespoke safety messages, driver warnings and passenger information. LED Monitoring – Over 15,000 monitoring devices fitted on vehicles. Induction Loop systems – 4,000 vehicles fitted with Audio frequency induction loop equipment. Automatic Light Control – 3,000 vehicles fitted with automatic day running light control and automatic saloon light control. Alarms, audible warnings and reversing aids – over 8,000 vehicles fitted with safety warning devices.